Find out how much is ¥67,000 JPY in your currency? 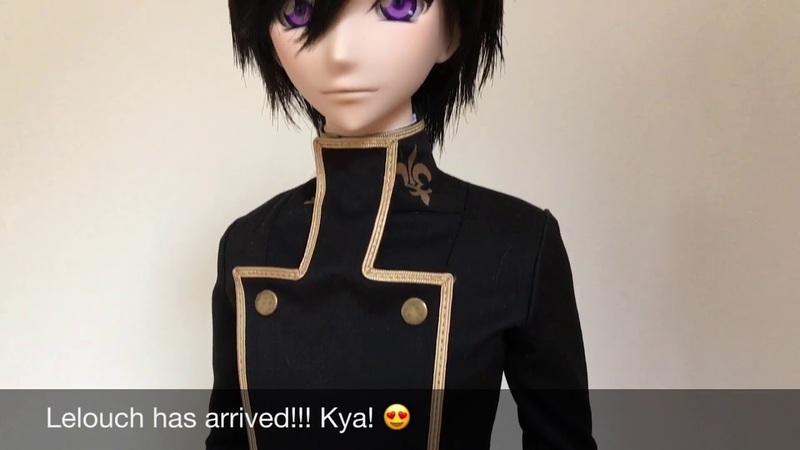 Lelouch Lamperouge is the hero of the worldwide hit anime series Code Geass and now for the first time ever as a 60cm tall fashion doll. Lelouch comes in 2 flavors - Default and Deluxe. The Default Edition comes with his "Geass Eye Expression" head - the left eye is the Geass eye while his right eye is his normal eye. In addition to the "Geass Eye Expression" head - the Deluxe Edition comes with Lelouch's "Smile Expression" head where he has a cute smile (or so I have been told) where both of his eyes are normal (non Geass). Both Default and Deluxe comes with 1 body (new slim type), 2 wigs (one for styling and one for running your fingers through), one telescopic stand, Ashford Academy boys uniform (jacket & trousers), 1 pair of shoes and a pair of leggings with neck sleeve as a color staining prevention measure. Just to clarify again - the Deluxe Edition only comes with 1 body. The Default Edition *does not* come with the Smile Expression head. Quantities are limited and once the limit has been met then the pre-order period will end - if you want him then order as soon as you can. Shipping is scheduled to start on 2017 October 16th and may take up until end of December depending on how fast you was able to checkout. However depending on the production line, we may be able to start shipping before October 16th. We make and ship the product from Japan. Because this is a licensed product, we cant process any refunds unless the product is faulty - please take note when ordering. if this is not cool then refrain from purchasing or wait for reviews - but then again it may be too late. Do note that anything you order with Lelouch will be shipped together with him when he is ready for shipping. Take note that we take payment at time of pre-order. If you are in Japan and choose bank transfer as a method of payment - please pay within 3 days of ordering or the system will think you are a troll and automatically cancel and restock. Lelouch comes with leggings and a neck sleeve as a color staining measure but there is nothing on the *outside* surface of the jacket and trousers to prevent staining - which *may* occur if his hand is in contact with the surface for prolonged periods. Take note that the wig in these product photos has been set with some styling spray - they do not arrive styled - feel free to style the wig as you see fit. Use these photos as a reference. I have included 2 wigs in both the Default & Deluxe packages - one to style and one to run your fingers through and pat. Here is the wig styling video! Smart Doll is hand made in Japan - the frame in Yamagata Shinjo, Shell parts in Katsushika Tokyo, Assembly and QC in Gotanda Tokyo while apparel is made in Kyushu and Tokyo. Comes with 1 year warranty (because we believe in our product). Lelouch comes with a pair of default hands but having the option hand set will give you a wider variety of poses that you can do. If you want Lelouch to help charge your gadgets then you will want the USB Hub too. If you are going for the Deluxe Edition and want a body for the extra head then you may want to buy an extra Slim Body.